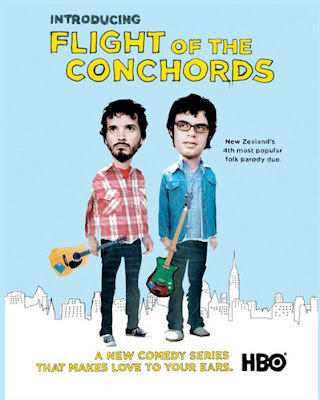 If you have not caught the new HBO series, Flight of the Conchords, do yourselves a favor and set a reminder, set your Tivo, crash your friend's pad that has HBO, whatever you need to do so you do not miss another episode. The show follows the lives of two New Zealand folk artists as they try and make in the Big Apple. So far they have found a manager who also works at the New Zealand consulate, a crazy married fan and a new friend that owns the local pawn shop. They are still searching for fame. However, in real life, the two have had a little more success. The project started in 1998 for the two stars of the show, Bret McKenzie and Jemaine Clement, as a touring musical comedy act. They have won several awards, released a live album and are currently signed to Sub Pop. Add to that their new show on HBO and they seem to be on the right track. The real star of the show though? The music. Part musical, part faux reality TV, the scenes do not get to far before one of the two actors breaks into song. And the songs are good! Funny and varied in the music style (not straying far from electro-tinged folk using their beat machine) they help tell a hilarious story.